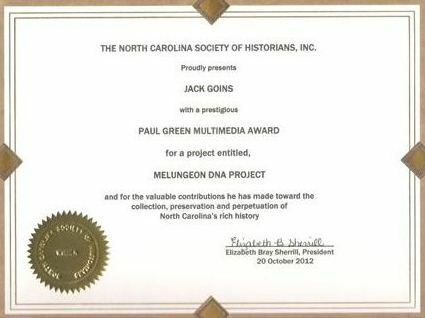 The Melungeon DNA paper, “Melungeons: A Multi-Ethnic People,” was honored on October 20th by the North Carolina Society of Historians at an awards ceremony in Mooresville, NC. The North Carolina Society of Historians is a nonprofit organization founded in 1941 whose goal is to preserve and share the history of North Carolina. One of the ways they do this is by encouraging the preservation of history and research into historical topics by conferring awards annually on worthy projects and their authors. Awards are granted to organizations and individuals in 14 different categories and the awards are presented at the annual meeting, which is a luncheon, in October. 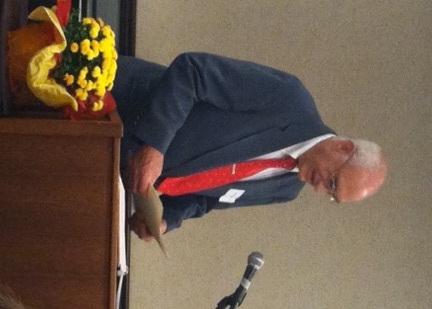 This year’s banquet was held on Saturday, October 20th in Mooresville, NC. The Melungeon DNA paper titled “Melungeons: A Multi-Ethnic Population” was granted the prestigious Paul Green Multimedia Award. Jack Goins, the founder of the Melungeon DNA projects and one of the authors of the paper accepted the award in Mooresville on behalf of all four authors. In addition to Jack, the authors are Janet Crain, Roberta Estes and Penny Ferguson. Each author received an individual award recognizing their contribution. Jack said that Elizabeth Sherrill, the Society President, had many complimentary things to say about the paper, and that she showed an impressive pile of papers and projects that represented the other entries that were rejected. Apparently, the competition was stiff. I know they have hundreds of entries every year. The authors would like to collectively thank the North Carolina Society of Historians, not only for the award, but for their dedication to the preservation of history and fostering an environment that rewards people for doing so. This entry was posted in History, Melungeon and tagged General Information by Roberta Estes. Bookmark the permalink. Congrats on a fine job Roberta and others. Congratulations on an award that is well-deserved! Congratulations, Roberta and your co-authors! Superior! I’m proud to know ya! I would like to extend my gratitude for this joint effort probing the rarity and uniqueness of the Melungeons. I look forward to reading, “Melungeons : A Multi-Ethnic Population”. Congratulations to all of you for your dedication to finding the truth about the human journey and for uncovering how DNA has played a substantial role in the peopling of the world. Kudos to Jack Goins, Janet Crain, Penny Ferguson, and especially to Roberta Estes, for her unceasing commitment to a multitude of DNA Studies! Thank you very much. We do what we do because of our love of genealogy and history, and to bring our ancestors alive, so to speak. But having said that, it’s still nice to have our work recognized by groups like this, but also and perhaps more importantly, by our peers. It means a great deal. So thank you again! You applied to the Melungeon Y-line project. Mr. Goins is correct, you can’t join that project because you’re a female and have no Y chromosome. To join the Yline or mtdna Melungeon projects, you must be paternally or maternally related to or descended from the core family lines which are set forth in the paper. The Melungeon Families group is for everyone who is not paternally or maternally direct line related, and you were invited to join that group. It’s not unusual for newbies to be confused about who can join Y projects and how Yline and mitochondrial DNA is inherited. Many people apply to the wrong projects and are redirected, as you were. Congratulations Roberta and your team. I thought it was an excellent report also! Hi. I hate I missed this event. I live in Mooresville and I am a Stewart and Evans descendent. I have a Stewart/Wilson DNA cousin who is a part of the Melungeon project. Congratulations on your award and acknowlegement. Hi Roberta – was going back through your posts related to the Melungeons. A few of my lines are Cantrells who were in TN and then eventually moved on to MO. I am stuck on a Ruben Cantrell that married a Marena “Rennie” Bunch. In trying to determine the parents of Marena “Rennie” Bunch I stumbled upon the whole Melungeon topic and am so glad I did. It is very interesting to say the least. I just wanted to say thank you for all of the research and work you do!